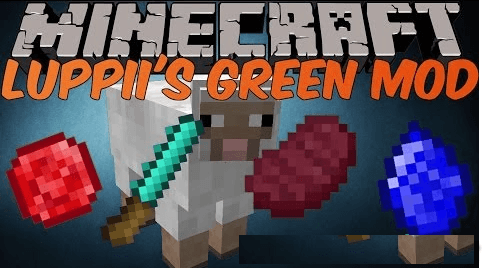 Luppii’s Green Mod adds more blocks, crops and items to Minecraft. For example a new tool, the Pruning Saw, which cuts down leaves very fast + destroy leaves in an area around the source block. [New] Update checker function added. You no longer need to check manually for updates if you have this or a newer version added. [Update] Raw mutton now has same ID as Cooked mutton. All existing raw mutton in your world will become oranges (orange have the old raw mutton id). [Update] Cooked Mutton now regain for 6 hunger (+2). [Update] Raw Mutton can now be eaten to regain 2 hunger. [New] Squid now drop Raw Squid. Raw: 2 hunger. Cooked: 3 pieces, 2 hunger each. [New] (Raw) Coconut ? Drop from Palm tree. Use an axe on a raw coconut to get coconut. Use an axe on coconut to get Coco Water, drink to regain 4 hunger. [New] Orange ? Fruit drop from Orange tree. Peel (use in crafting grid) for 4 slices, eat to regain 1 hunger for each slice. [New] Palm Tree. Place a raw coconut in crafting grid to get a palm tree sapling. [Update] Durability on Ruby/Sapphire tools has been raised from 250 to 384. [Update] Pruning saw now lose 1 durability every 5 blocks destroyed.